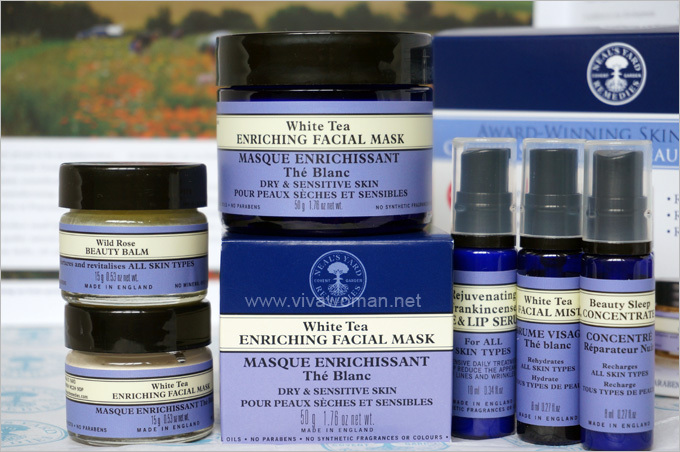 If you’re checking out Neal’s Yard Remedies and don’t know which face care products to get, I would suggest you take a look at their Award-Winning Skincare Kit which consists of five products in travel size. I had a chance to try them out when I was gifted with the kit during their opening in October and I’ll like to share my thoughts about them. Actually, I started reviewing this range of award-winning skincare kit from Neal’s Yard Remedies much earlier but thanks to a multitude of distractions and sheer laziness, I’m only able to complete it now. Well, at least it’s still within the year! But just in case some of you are wondering, I am no longer using most of the products (except for the mask) as they’re all in travel sizes. Every product is brimming with natural antioxidants and active botanical extracts and I’ll preface this review by telling you that I love most of them. So come join me as I uncover the benefits of these award-winning gems. 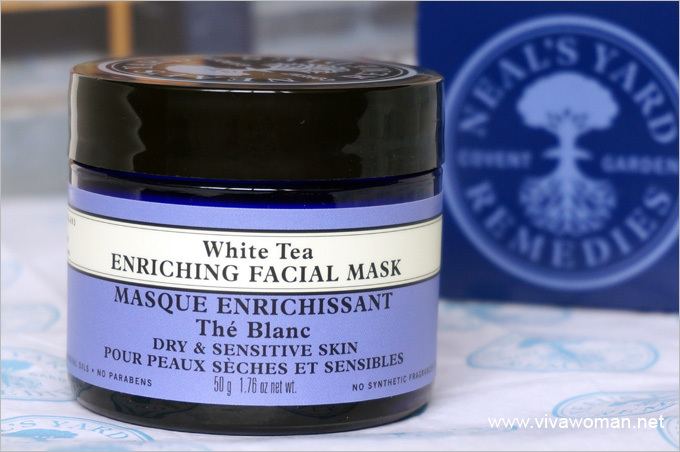 This is by far, my fave product from Neal’s Yard Remedies and I even have a full-sized jar (priced at S$68) so this is the one product in the range that I’m still using. I’ve always had a soft spot for clay mask and this one is made with 59 percent organically produced ingredients and 26 percent natural nourishing clay minerals. It is apparently formulated for dry and sensitive skin and is described as an intensive nourishing treatment to restore vital moisture levels, plump the skin and help reduce the appearance of fine lines. So why do I love this clay mask and how is it different from the other clay masks in the market? 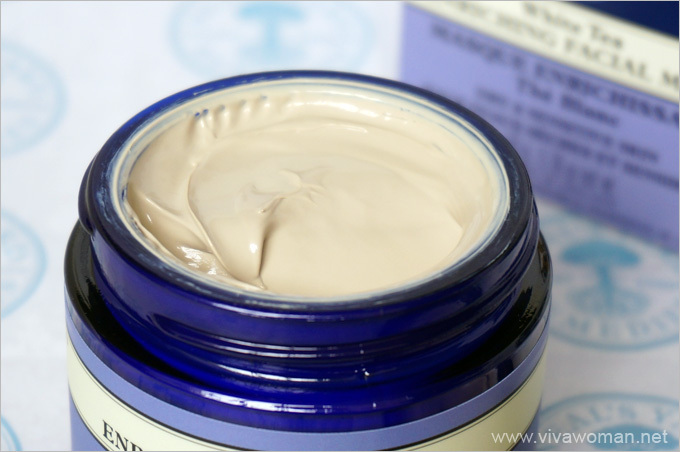 A clay mask by any other name is still a clay mask to cleanse and detox, and going by that alone, this Neal’s Yard Remedies White Tea Enriching Facial Mask is no different. Yet, this mask makes me feel fabulous like no other clay mask would. Maybe I can say it this way: this clay mask doesn’t quite make me feel like I’m using a clay mask; in fact, sometimes I forget and I think I’m using a hydrating or moisturizing mask. In terms of texture, this clay mask feels unusually smooth. I don’t get that powdery texture I usually find in clay mask. On top of that, this product smells absolutely gorgeous and I suspect that’s what draws me mostly. Otherwise, it hasn’t yielded me any special benefits so far other than keeping my skin clean and smooth. However, I was dismayed to find alcohol denat listed under its top five ingredients although I can live with that given that I only use this once a week. 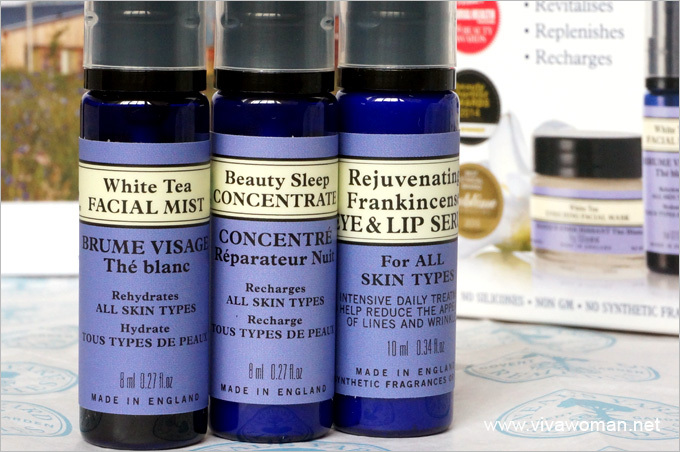 My next favorite product is the Neal’s Yard Sleep Concentrate made with 90 percent organic ingredients. This product comes across more like a lotion but it’s clinically proven to moisturize up to 24 hours and so it should work for most skin types with the exception of those whose skin are extremely dry. I wasn’t too impressed when I started using it because I didn’t really see much of a difference to my skin. Given the name, I was expecting to see some difference the morning after using it but I didn’t. But as I continued to use it, I began to see its merit of being an awesome single product that handles my skin care needs at night. It is is lightweight and yet, good enough to be used on its own—which means, I don’t need to apply anything else over or under. I also like that it’s designed for night time skin regeneration and it smells delightful with its blend of aromatherapy essential oils renowned for their calming, relaxing properties. Aqua (Water), Glycine soja (Soya) oil*, Glycerin, Cetyl alcohol,Cetearyl olivate, Cetearyl glucoside,Vitis vinifera (Grape) seed oil*, Theobroma cacao (Cocoa) seed butter*, Ricinus communis (Castor) seed oil*, Narcissus tazetta (Chinese sacred lily) bulb extract, Aloe barbadensis (Aloe vera) leaf juice powder*, Palmitoyl tripeptide-5, Sodium hyaluronate, Cananga odorata (Ylang ylang) flower oil*, Citrus sinensis (Orange) peel oil expressed*, Pogostemon cablin (Patchouli) leaf oil*, Styrax tonkinensis (Benzoin) resin extract*, Alcohol denat. *, Cupressus sempervirens (Cypress) leaf oil*, Salvia sclarea (Clary sage) flower oil*, Sorbitan olivate, Sodium levulinate, Levulinic acid, Tocopherol, Helianthus annuus (Sunflower) seed oil, Xanthan gum, Potassium sorbate, Benzyl alcohol, Benzyl benzoate, Benzyl salicylate, Citral, Eugenol, Farnesol, Geraniol, Isoeugenol, Limonene, Linalool. *Organically produced ingredient. Natural constituent of essential oils listed. Made with 90% organic ingredients. This is a vegan product. I love this White Tea Facial Mist too but unfortunately, it’s the first product to be depleted, given the small size and twice-a-day usage. I’ve ran out of adjectives to describe smell so let’s just say this one is intoxicating and works to soothe my nerves extremely well. So yes, this mist delivers according to its promise to calm and I agree that it refreshes and rehydrates the skin too. But based on some reviews I’d read, this mist helps to soothe problematic skin conditions. This product is NOT in the Award-Winning Kit but since I was using it during the same period, I thought I’ll quickly share my thoughts about it. As the name suggest, this is to be used on the eye and lip. It’s a slightly creamy lotion but doesn’t feel too heavy. I did try using it on my lips but I much prefer this around my eye area. However, I used it for a couple of weeks and didn’t noticed much of a difference to my eye area and subsequently gave it up. Anyway, most eye products do not deliver results for me and so I wasn’t expecting too much. But if your eye area isn’t particularly crinkly and you’re just looking for a product to moisturize your eye area, this can probably do the job quite well without leaving your eyelid all greased up. Aqua (Water), Glycerin, Sucrose distearate, Adansonia digitata (Baobab) seed oil*, Sucrose stearate, Cetyl alcohol, Ricinus communis (Castor) seed oil*, Borago officinalis (Borage) seed oil*, Oenothera biennis (Evening primrose) oil*, Rosa canina (Rosehip) fruit oil*, Boswellia carterii (Frankincense) oil, Citrus nobilis (Mandarin) peel oil expressed*, Citrus bergamia (Bergamot) peel oil expressed*, Curcuma longa (Turmeric) root extract, Palmitoyl tripeptide-5, Alaria esculenta (Algae) extract, Aloe vera barbadensis leaf juice powder*, Sodium hyaluronate, Tocopherol, Helianthus annuus (Sunflower) seed oil, Sodium dehydroacetate, Xanthan gum, Caprylic/capric triglyceride, Levulinic acid, Citral, Citronellol, Limonene, Linalool. *Organically produced ingredient. +Nut/seed-based ingredient. 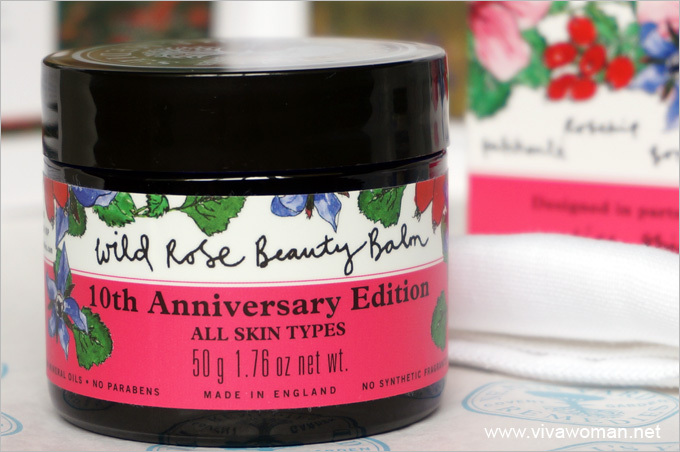 I’ve ready reviewed this one (click here to read the full review) but to recap, this is a product that contains 99 percent organic ingredient. 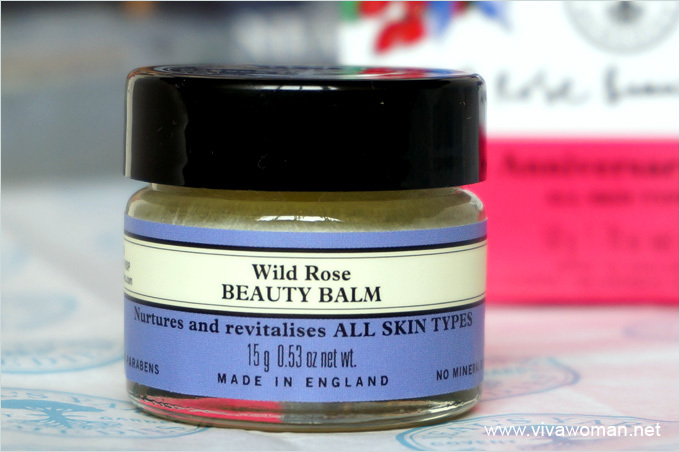 This balm is above average in terms of ingredients and quality. However, because beewax is listed third on the ingredient list, I rather not use this on my face on a long term basis. But otherwise, it’s good as a moisturizer and for keeping dry skin nourished. I believe that those who live in colder climate will appreciate this balm better. I’ll say the travel size is most ideal for my purpose because I don’t use it as a cleanser. So this 15g bottle from the Award-Winning Kit is the best. And hereâ€™s the full ingredient list: Rosa canina (Wild rose) seed oil*, Simmondsia chinensis (Jojoba) seed oil*, Cera alba (Beeswax)*, Butyrospermum parkii (Shea butter)*, Cannabis sativa (Hemp) seed oil*, Borago officinalis (Starflower) seed oil*, Pelargonium graveolens (Geranium) flower oil*, Rosmarinus officinalis (Rosemary) leaf oil*, Boswellia carterii (Frankincense) oil, Cymbopogon martini (Palmarosa) herb oil*, Pogostemon cablin (Patchouli) leaf oil*, Ascorbyl palmitate, Tocopherol, Citral, Citronellol, Farnesol, Geraniol, Limonene, Linalool. *Organically produced ingredient. Natural constituent of essential oils listed. This is described as a luxurious two-step cleanser that leaves skin feeling beautifully soft, smooth and rejuvenated. Why two steps? Well, first step is where you massage the cream to gently cleanse and step two involves using the muslin cloth (comes with the kit) to delicately smooth and refine. This is probably a product I would consider purchasing. I remember I quite like it even though I only used it once because the little I tried was from the sachet in the Award-Winning Kit. It’s really a cream cleanser enriched with firming and toning frankincense, antioxidant essential fatty acid-rich organic baobab and intensely moisturising organic cocoa butter. The texture is creamy enough to cleanse my face properly and the smell is just up my alley. 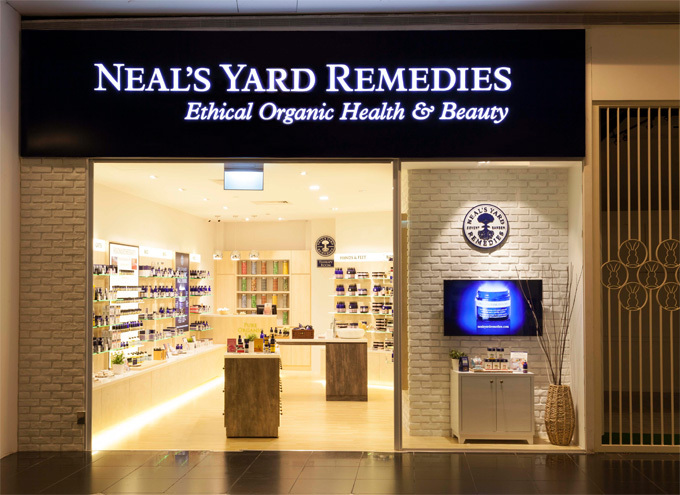 The Neal’s Yard Remedies Award-Winning Skincare Kit, priced at S$58, is great for sampling some of the brand’s highly-raved products before deciding which full-sized products you’ll like to commit to. The smaller size in the kit also make great traveling companions although I wish the face mist and beauty sleep concentrate come in a slightly bigger size. 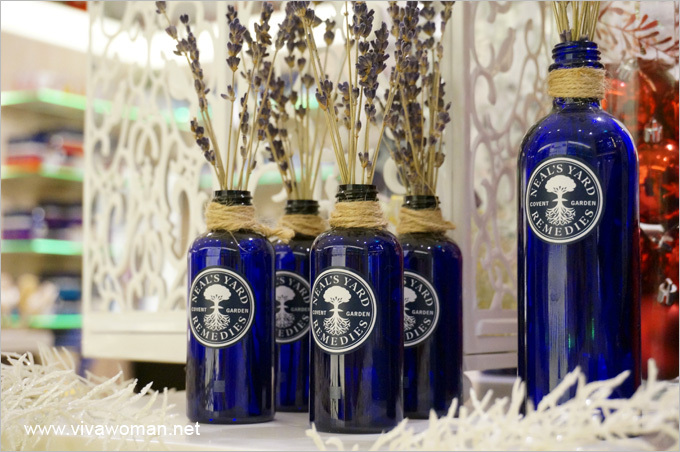 All Nealâ€™s Yard Remediesâ€™ products contain no synthetic fragrances, no silicones, no mineral oils, no parabens, no GM ingredients, no phthalates, no propylene glycol, no animal testing, no DEA, no EDTA, no acrylates, no nano, and no BHT. However, I wish all products come without alcohol denat too. Besides the Award-Winning Kit, Neal’s Yard Remedies has also packaged together an Age-Defying Skincare Kit, a Normal Skincare Kit and a Dry Skincare Kit (these are priced at S$48). All kits can be found in Nealâ€™s Yard Remedies at Millenia Walk #01-75. I understand that the brand is currently offering a 10 percent discount for the kits (and other products) so if you’re hard pressed for some last minute Christmas gifts, these may just be the thing to consider. Hi, how much is the beauty concentrate n kit? I just found out – $58 for the award-winning kit and they’re offering 10% off till end of this month. Hope to read some of your reviews when you’ve tried them. Oh no! I’m terribly weak against skincare sets but I have too many products hoarded at the moment. Would love to give this a try because of the clay mask and the refining cleanser, bumping these up on my to-get list! Happy holidays to you and your family Sesame! Hey Kay, Blessed Christmas to you and your family too! I have never tried any of the Neil’s yard stuff. Looks great!! Thanks for such a lengthy review on these products. I’ve been looking for something to get my girlfriend for her birthday. I think this skin care line might be just the thing. I’m going to have to think about it. It’s a great line…she would love it. Wow great. It seems a good product for skincare. I want to use this cream on my skin. because I always try Neilâ€™s yard stuff.